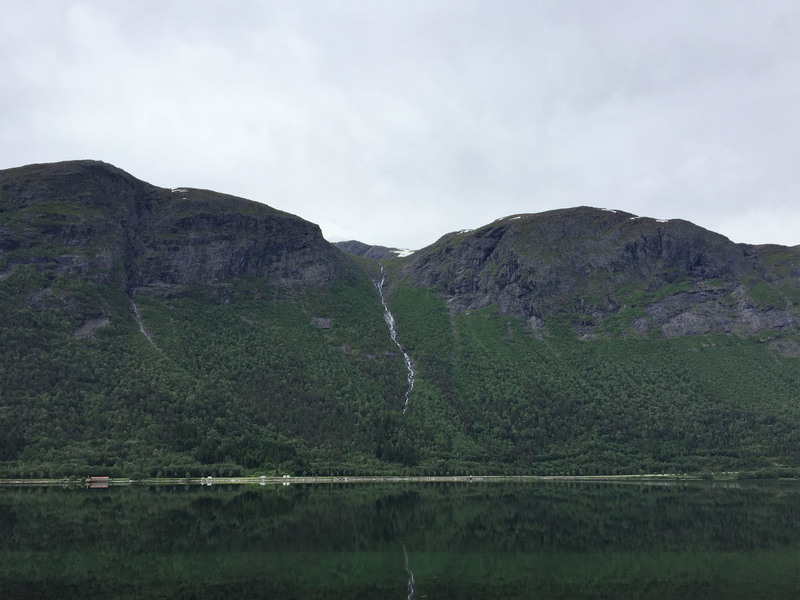 We awoke in Åndalsnes to the most serene, calm view; one of utter stillness on the Romsdalsfjorden. The reflection of the neighbouring hills was mirror-perfect. There have been so many varied façades to the ever-changing scenery in Norway, but this rare reflective stillness, oozing elegance, beauty and a deep calm, had become a firm favourite. 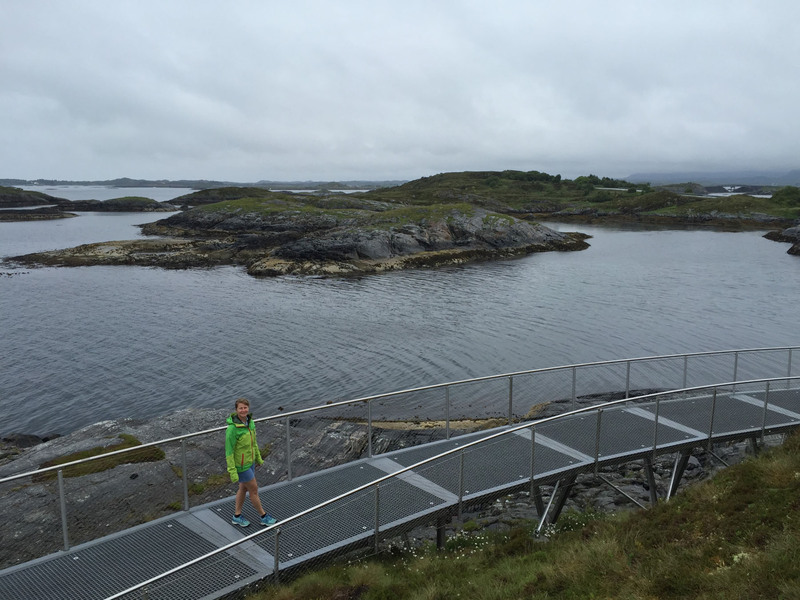 We hugged the coast of the fjord until we reached Åfarnes where we caught the ferry over to Sølnes. 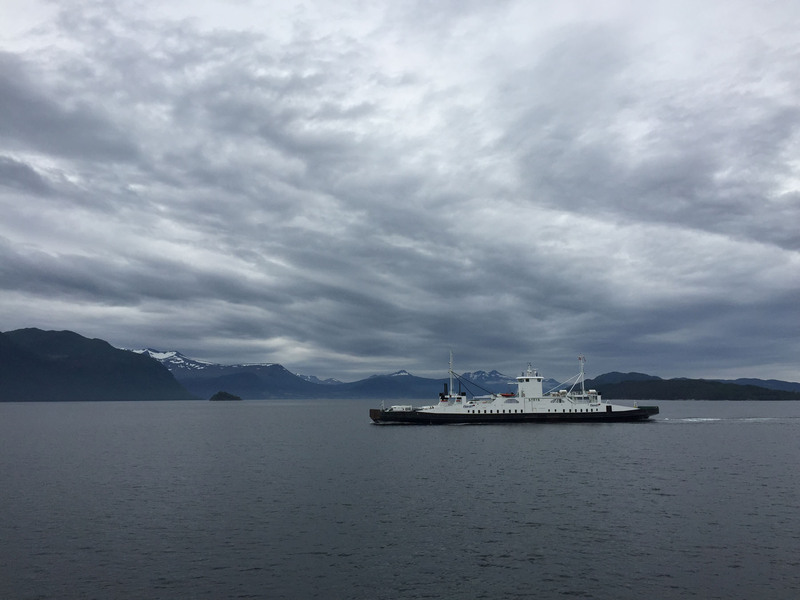 The ferry cut a sharp, black line through the motionlessness of the blue fjord water. 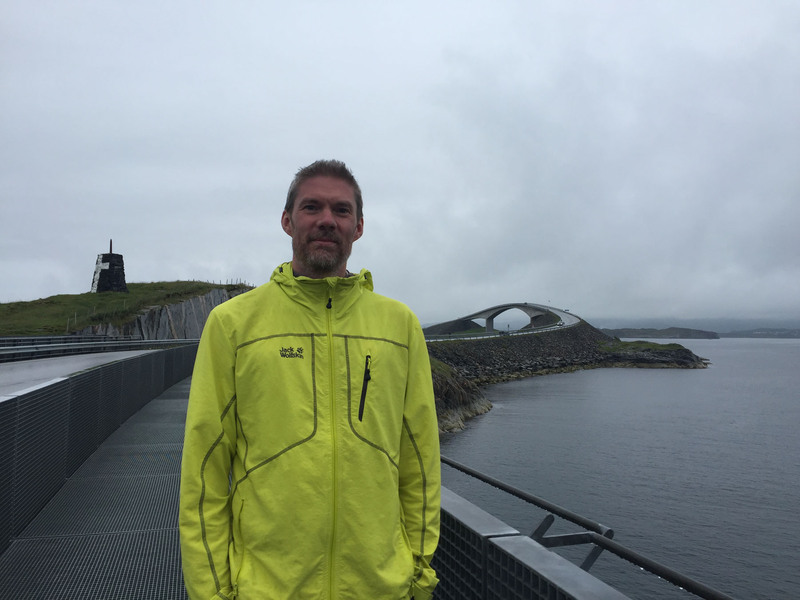 We made our way to the town of Molde, passing through a tunnel under the fjord and the nearby airport runway to reach the centre. It was a rather nondescript and busy town with lots of recognisable shops and brands, a generic blueprint of a typical port, but our first impressions were no doubt influenced by the arrival of a thick blanket of cloud, obliterating the blue skies and sun. We drove through to the end of the centre, but didn’t stop, instead returned a little then turned steeply left, to climb up the mountain behind in the direction of the Varden viewpoint. The tarmacked road ran out a few kilometres shy of the top, so we parked in a lay-by at this point and decided to walk the remainder. We’d had a few long driving days and little exercise, so we wanted to stretch our legs and earn the view. 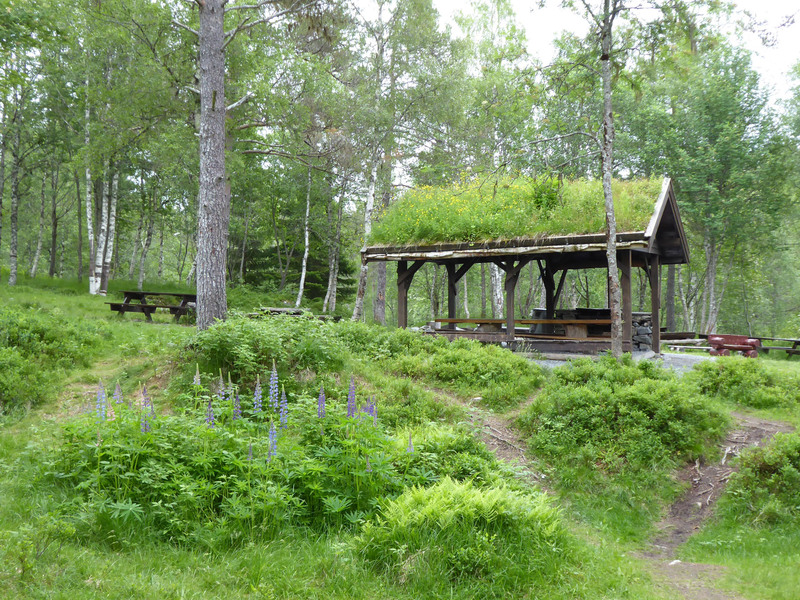 It is said the panorama from this viewpoint encompasses 222 snow-clad peaks, on a clear day. We made our way up the gravel road to see. 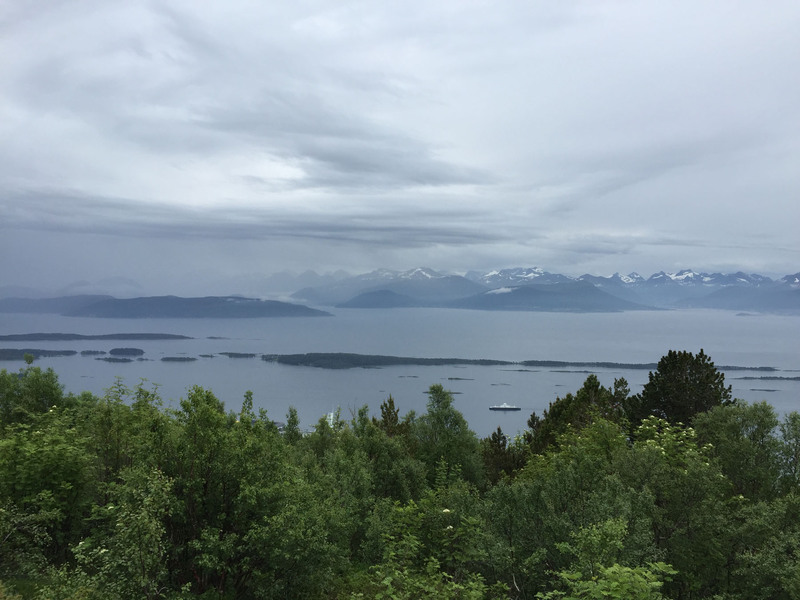 We reached the top of the road and, after having been enclosed in tall, bushy trees the entire route, we were suddenly rewarded with the most spectacular view out to sea, across the islands and skerries of this region of the Romsdalsfjorden. The view was moody and monochromatic, whitewashed with low cloud, but clear enough that it stretched to our starting point for the day and beyond back to the valley where we’d descended the Trollstigen. We could see ferries slowly floating across the still waters, looking thin from our perspective, like cardboard cut-outs. We sat and gaped at the view for a while, taking it all in, before making our way back to Benny. The clouds turned again to rain on our descent, a light drizzle that had definitely settled in for the long haul. 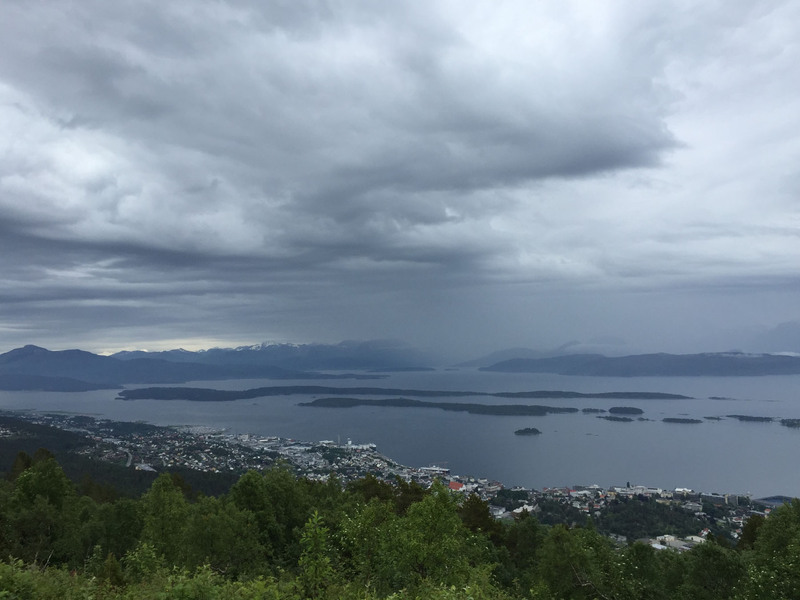 We drove north along the coastline from Molde, through many working towns dominated by dozens of auto-repair shops, to the town of Bud. Here we parked up at the museum, to have some lunch and sit out the rain. 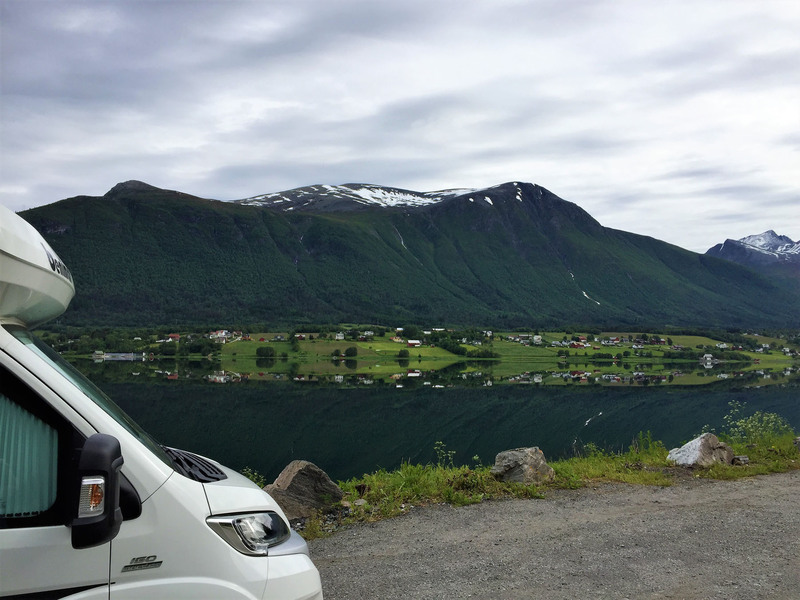 By the coincidence of having similar numberplates, (and the fact there are so few Brits motorhoming in Norway) we met another British motorhoming couple who came over to introduce themselves – Paul & Sue. We chatted briefly about countries, travel plans and blogs, then swapped contact details – beerandbangersineurope.wordpress.com – is their travel blog. Over the past few weeks we’d been exploring the Norwegian Fjord area along the ‘tourist driving routes’, each set up to direct and facilitate visitors along the most scenic routes. 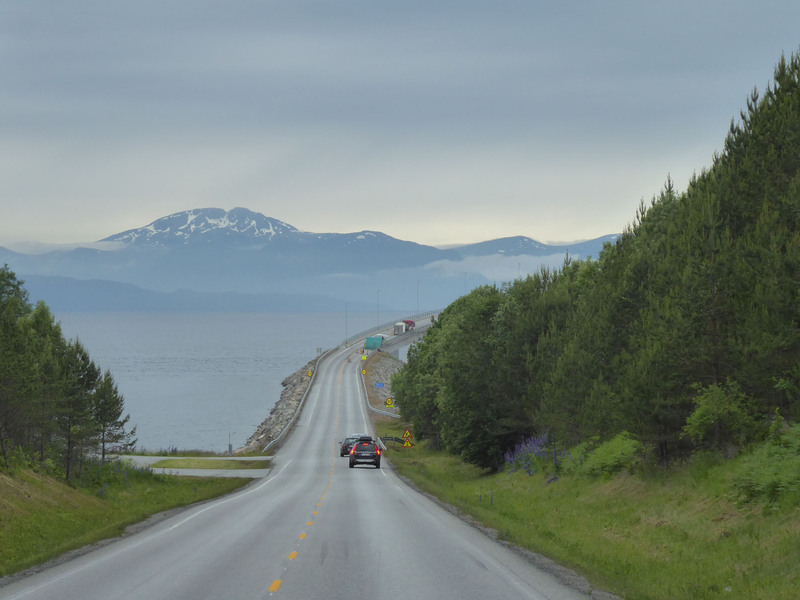 Often these roads took us across high snow-clad passes, up and down hairpin climbs and descents, and alongside majestic fjords. 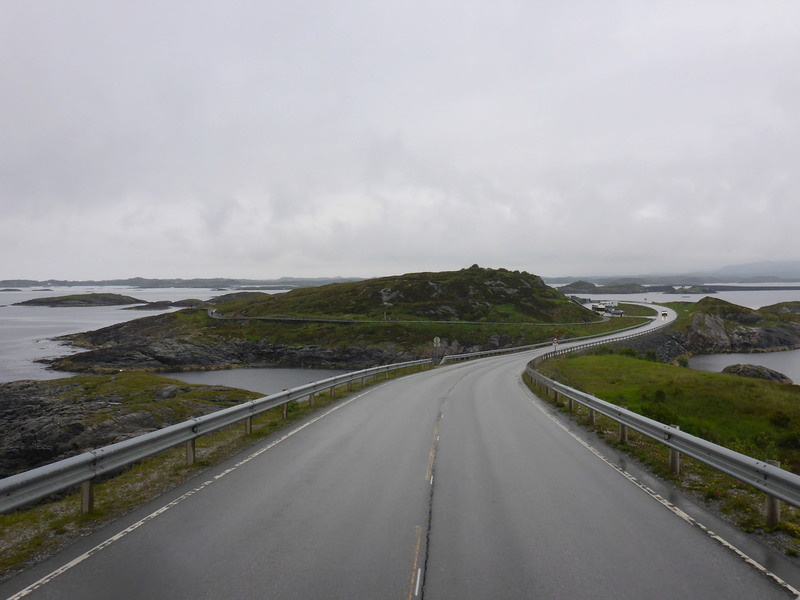 Of the ten routes specifically created, we would today complete our eighth, and likely final; the Atlantic Road (Atlanterhavsveien) from Bud to Kristiansund. It was a shame it was so grey and wet for this concluding stretch. 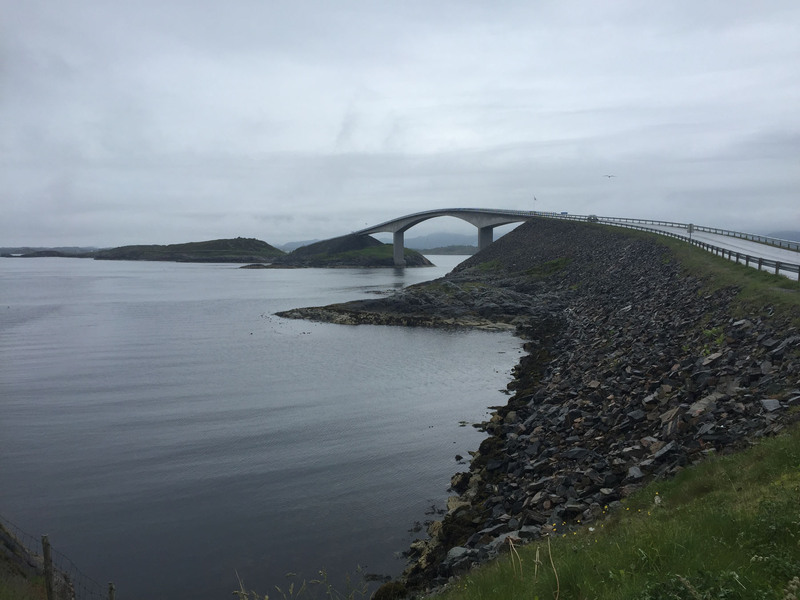 Back at the coast the Atlantic Road began with rocky outcrops, small islands and skerries, building to its main display of high-backed, seemingly twisting bridges built between a series of rocky, moss-covered islands. There were several places to stop and examine the view, so we dutifully did so. We saw fishermen easily reeling in large catches from the sea off the side of bridges, large pillars securely supporting the curving raised bridges, and watched many birds hovering over the cleverly engineered route, it unnecessary for their onward mobility. We stopped again at another visitor centre, trying to slow our progress over the road to ensure we appreciated the journey and the location. We met Paul & Sue again as we wandered around a built circular walkway where we had another chat in the rain. 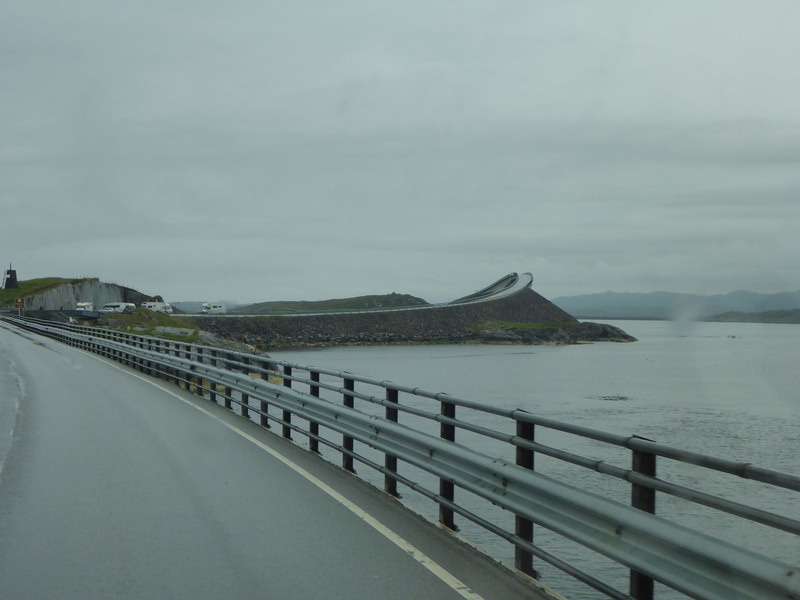 Then we doodled off to complete the last stretch of the Atlantic Road and took the expensively tolled 6km long Atlantic Tunnel from the end of this road under the ocean and into the town of Kristiansund. The free aire we had been aiming for had been taken over as a large bonfire site for the local Midsummer festivities, so we parked in a nearby paid car-park that had dedicated motorhome spaces. We’d arrived late afternoon, so only had to pay for one hour of parking (8 NOK) to see us through until 11am the following day. 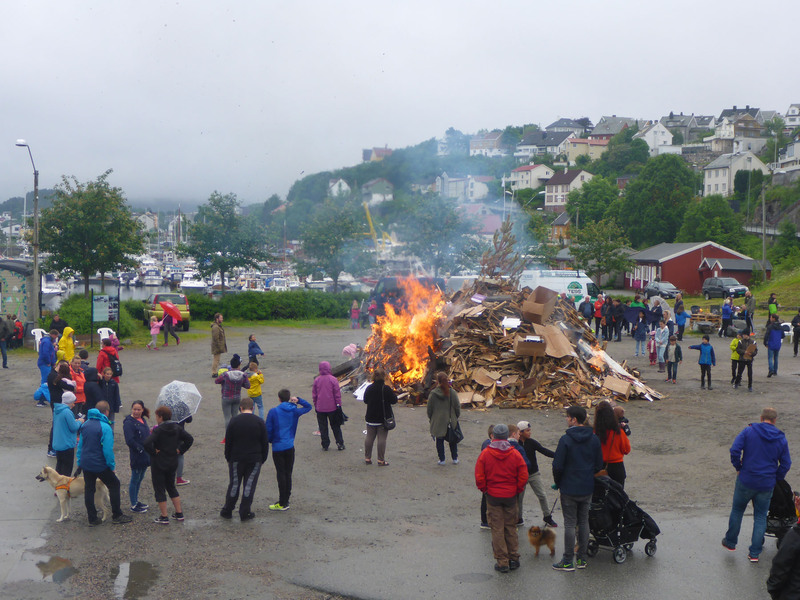 We walked along the rather scruffy but full and busy marina, to see what celebrations were happening around the bonfire. 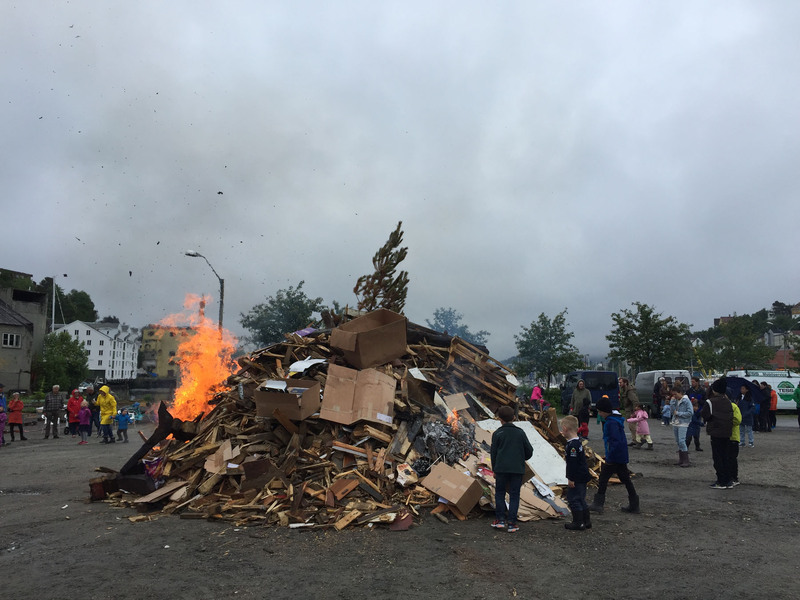 It was spitting with rain and dampening the air and the mood, and all there was to see were a few families with folding seats and disposable barbeques gathered around under umbrellas, watching the flames. Smoke and ash were blowing into a nearby restaurant that was unfortunate to be downwind of the fire. The entire scene had an appearance of trying hard, but it lacked an intrinsic energy and that essential feeling of joie de vivre; it was all just a little sad in reality. We walked the opposite direction, passed where Benny was parked and into the centre of town. 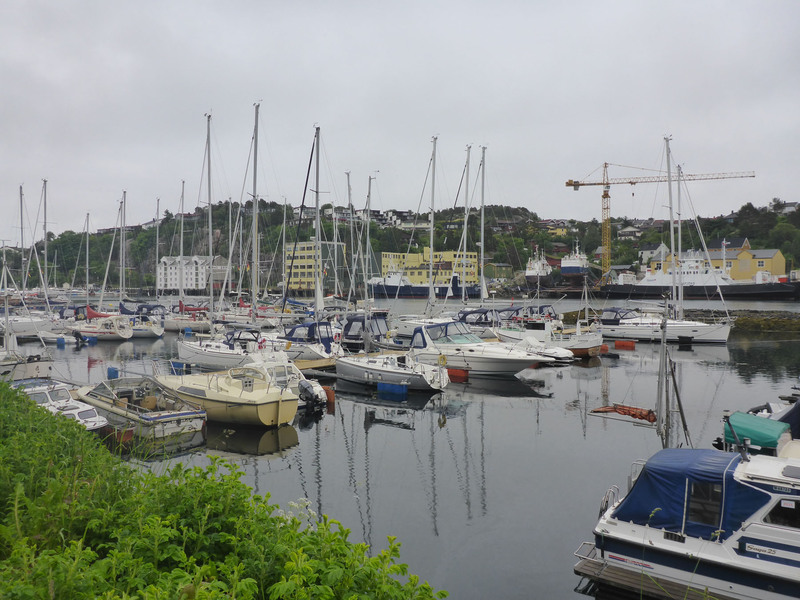 Kristiansund is on four separate islands, making it difficult to visit other areas without driving or owning a boat, so we only saw the central portion on the same patch of land as us. To escape the rain we walked through a shopping centre, popping out on a pedestrian street lined with shops all closed for the holiday weekend. We walked up to a large stone building, a town hall or municipal court, but never found out what as it was closed up. 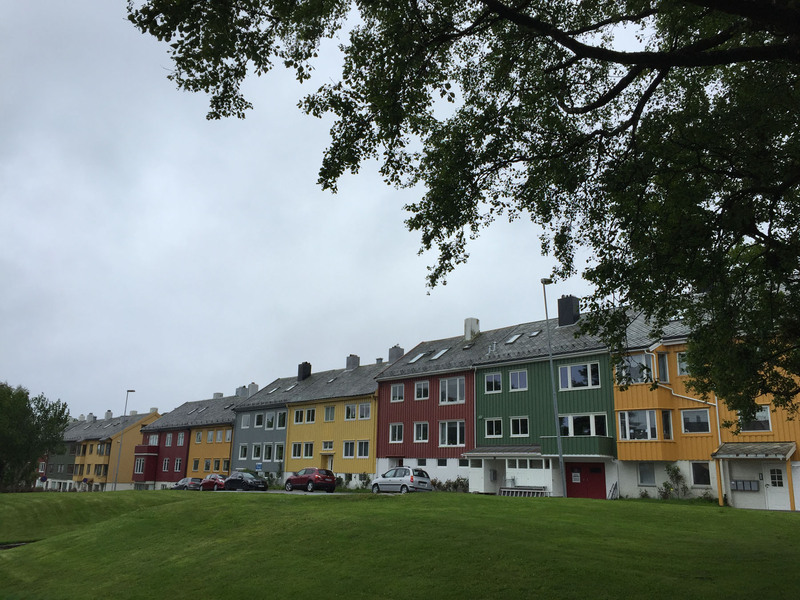 We passed rows of colourful timber houses, a quintessential view of the town, but saw little else that caught our interest. Instead we opted for returning to Benny, sheltering from the cold rain and celebrating our personal Midsummers by cooking a nice meal and opening a bottle of red. This entry was posted in Our Travel Journal on Jul 2, 2017 by Aaron Hill.